His team were the now disbanded Fir Tree, the junior football club that 11-year-old Rhys Jones played for and had just finished training with when he was shot dead in Liverpool in August 2007. Geoghegan was the coach who offered Rhys a lift home that summer’s evening and moments later witnessed the schoolboy, who decided to walk, fall to the ground and become a victim to gang culture. Talent spotted on the football pitches of Merseyside will play a major role for England at this summer’s World Cup. Captain Steven Gerrard, Wayne Rooney and his successor as Everton and England’s next great hope, Ross Barkley, may all be integral to Roy Hodgson’s prospects in Brazil and in shaping the national mood. The production line on Merseyside is performing above the statistical norm, while its two historic top-flight clubs pursue Champions League football and the £40m qualification offers. Nationally, there has been a 9% decrease in the number of 16-year-olds and over playing football at least once a week in eight years, according to Sport England. There are myriad reasons – lifestyle changes, the recession, houses standing where pitches used to be – and many projects, plus thousands of dedicated people, attempting to combat the problem. One is Mick Baikie, the national clubs services manager at the Football Association and also coach of his local junior team, Lichfield City. 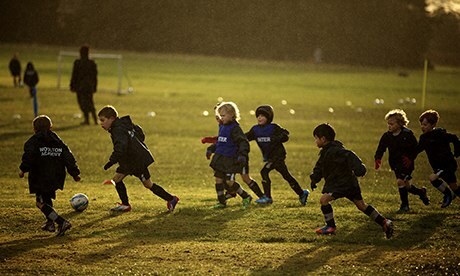 “There has been an increase in participation between under-sevens to under-10s and in boys’ youth football, although a levelling off in girls’ youth football,” counters Baikie, who oversees the FA‘s charter standard programme for grassroots clubs. “But one of the biggest challenges we face is facilities. We’ve got qualified coaches but we haven’t got the facilities for them to coach and play. The big problem now is the public sector cuts – 80% of games are played on local authority sites that have been heavily subsidised in the past but we are starting to see an impact with the cuts. One council recently raised their fees from £400 per pitch, per season to £1,600. That’s happening all over the country and it is a real challenge to get teams on to pitches. 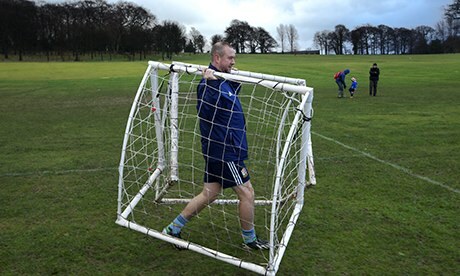 It is 8.30am on a Saturday at Camp Hill, a park in south Liverpool, and Saunders is putting out the goals and cones for some of the 62 teams that comprise Woolton FC. He has been doing it unpaid for the past 19 years, 48 weeks a year and regardless of the weather. Today’s weather is particularly grim. Several coaches have had to cancel training sessions after an early morning storm turned sections of the ground into a quagmire. A four-year-old girl in a pristine Barcelona away kit, brought by her father on his way home from work, waits expectantly for a game. Many more defy the conditions and Camp Hill fills as the morning progresses, although not in time for the girl in the red and yellow Barcelona stripes, who trudges home through the mud, head down and holding dad’s hand all the way. Still, it could have been worse. She might have wanted to use a toilet. There isn’t one at Woolton FC, a club based in an affluent suburb but whose members come from varying backgrounds across Merseyside and beyond, increasingly so as league numbers dwindle. 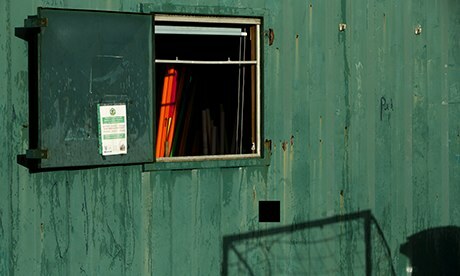 “It’s an embarrassment,” says Saunders as he surveys matches from the facilities at Woolton FC, or rather, facility – a converted shipping container that has been the club’s base since 1990. It contains goal frames, nets and a rack of small boots for children who cannot afford their own. There is also a tuck shop inside, run by pensioner Ailsa Robinson, who with her husband, Lance, has been a volunteer at the club for years – and, of course, the obligatory buckets under holes in the roof. That is it, for 62 teams, and Woolton are an FA charter standard community club – the most advanced level of a programme that recognises and rewards clubs that, according to the FA website, “are well run, sustainable, which place child protection, quality coaching and safety paramount”. Approximately 48,000 clubs are charter standard, 83% of teams in the under-sevens to under-18s range, and the scheme has played a major part in increasing the number of qualified coaches in the country, with the level one qualification a prerequisite. Saunders knows. 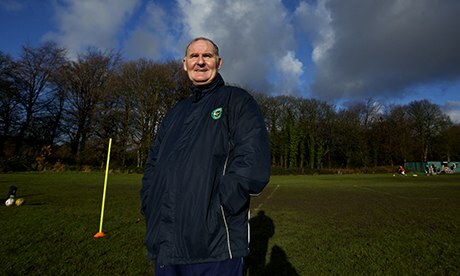 In December 2012 he organised a protest attended by thousands on Buckley Hill playing fields following Sefton council’s proposal to increase pitch fees for under-11s from £180 to £750 per season. The planned hike was dropped shortly afterwards. From there, he founded the Save Grassroots Football campaign that, with support from the Bolton North East MP, David Crausby, has an e-petition calling on the football authorities to give 7.5% of broadcasting income to the grassroots game. Scudamore added that the Premier League, in co-ordination with the FA, “take responsibility for the most substantial football solidarity programme in world football”. That includes the Premier League Charitable Fund, which last year contributed £45m to the Kickz campaign, Premier League 4 Sport and the Creating Chances community projects. That sum is to be spread over three years but represents an overall reduction compared to what grassroots received when the government, FA and Premier League were each providing £20m per annum. Together with the FA and the government, the Premier League has now committed £102m towards improving grassroots facilities through the Premier League’s and the FA’s facilities fund, which will begin to accept applications from Monday. That sum is to be spread over three years but represents an overall reduction compared to what grassroots received when the government, FA and Premier League were each providing £20m per annum. The Save Grassroots Football e-petition requires 100,000 signatures to prompt a debate in the Commons but has under 23,000 names, with one month remaining. It would have attracted more with the backing of the 50 county FAs that Saunders contacted about the campaign. Not one replied. “A radio station in Birmingham rang me before Christmas because Walsall council have proposed raising pitch fees from £380 to £1,600,” says Saunders, who will be holding a demonstration against price rises in Liverpool at Camp Hill on Sunday 26 January. “I’ve been told one of the leagues in Liverpool, who currently hire their pitches for £2,000 a year from the council, will have to pay £5,500 next year. 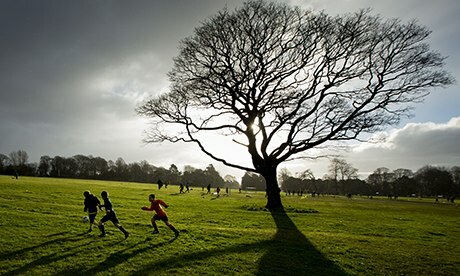 There is a possibility of administration fees going up from £130 to £350 for every team. People just cannot afford it. Surveys by Sport England show a drop in the number of people aged 16 and over who play football at least once a week – from 2,021,700 in the period October 2005 to October 2006, to 1,935,200 in April 2012 to April 2013 to 1,838,600 in October 2012 to October 2013. “We don’t look at the bigger picture in this country,” says Saunders, whose campaign is directed at all bodies with a vested interest in the health of the game. That includes clubs who apply to the Football Foundation for money from the Premier League Community Facility Fund, to which the Premier League donates £6m a year, to assist their own community projects. He explains: “We would like a committee drawn up from the Premier League, the FA, government and representatives of grassroots football and money dispersed from that. 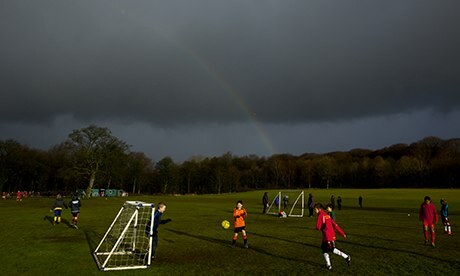 The transfer window is open now and every British player transferred would have been involved in grassroots football at some stage, so what about 1% of every transfer – agent fees included – going into a grassroots pool? “If kids can play football regularly that will help in some way towards the obesity crisis and the strain that puts on the NHS. And it’s not just about the football but about making friends, instilling discipline and helping the community. All we want here is for the kids and their parents to enjoy it and they do, there is a really good atmosphere around the club. Remarkably, the threat to Geoghegan’s life, and all that entailed for a friend of Rhys Jones and his family, was not the end for the Fir Tree manager. He was disillusioned with touchline abuse before the incident, with punitive fines not only for bookings and dismissals but for failing to register his team’s scores on a league’s website before 5pm on a Sunday. On one occasion he missed the deadline having taken his son to hospital with a serious leg injury suffered during a game. The fine applied. Geoghegan wanted to quit in the aftermath of the murder but was encouraged to continue by Rhys’s parents, Stephen and Melanie. He stayed on and helped establish a charity “to promote safe environments for young people to play football and to get guns off the streets”. The Rhys Jones Memorial Fund contributed to a community centre, with two 3G pitches, named after the 11-year-old but the annual football tournament in his memory, one that attracted over 500 children, is no more. The final straw for Geoghegan arrived in the post a few week’s after the violent threat. “I received a letter from the Liverpool County FA. It said I’d been fined £70 for getting the game abandoned and encroaching on the field of play,” he recalls. A personal hearing followed, the fine for encroaching was increased to £250 then eventually rescinded completely but enough was enough. “Basically, I just couldn’t afford to keep running the team and I wasn’t prepared to stand on the line every week listening to the abuse that goes on,” Geoghegan admits. Another one gone.